Many women's herbs do not have rigorous scientific studies backing their use, however, women over the centuries have used herbal remedies safely and effectively. This tradition is the wise woman's way. Herbs are used in women's health to regulate hormones, reduce water retention, elevate mood, and reduce pain and cramping and are used to treat menstrual problems such as PMS, heavy bleeding, skipped periods, excessive bleeding, and menopause. 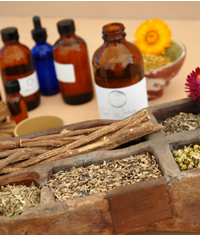 Pregnancy and natural childbirth are also supported by ancient herbal remedies. There are many herbs that a woman can choose from in treating menopausal symptoms, and the optimal one is very much dependent upon each individuals body chemistry and temperament. Herbs that bring on menstrual flow when there is delayed menstruation for are known as emmenagogue's. Herbs for the period before your period not only address the physical symptoms, and the underlying hormonal imbalance, but comfort the emotional upset as well. Heavy menstrual bleeding, clotting or irregular bleeding are come under the heading of menorrhagia. Serious bleeding can be a sign of uterine cancer or a fibrous growth, and should be diagnosed by a medical professional without delay. A painful period can range from a dull ache to a violent cramp. When we are in a fragile emotional state, menstrual pain can be even more severe. Rheumatoid arthritis is much more prevalent among women than men and is often passed down from mother to daughter. Women's Tonic herbs help to regulate hormone production. Hormonal balance is an important factor in the overall health of women and is often a root cause in PMS, menopausal problems, irregular menses, and low libido. Fibromyalgia is a painful condition that affects women disportionately. A herbal approach to treatment will include herbs that address adrenal gland support, stress management, and pain relief, as well as emotional needs. Women may be more susceptible to vaginal yeast infections if they are pregnant or have diabetes. Candidiasis is an infection caused by species of Candida fungi, especially Candida albicans. The same herbs have been used to prepare women for childbirth by midwives for centuries. One area of great benefit is their high concentration of vitamins, minerals, and other constituents that provide an excellent source of concentrated nutrition.